NARS Deep **Ahem** Throat Blush, how is it different from Orgams? 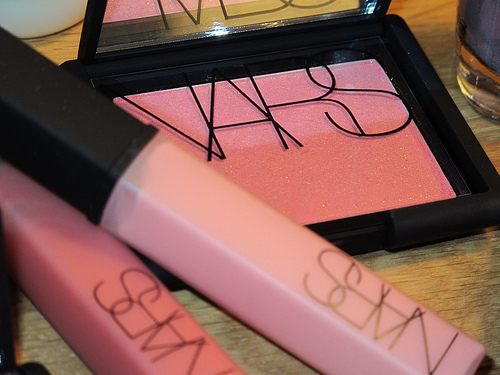 "When I created NARS, I was either going to name them with numbers or give them intelligent names. I wanted to give the products a character and an identity. The names make you dream and transport you to another place. It gives the color a fun twist." François Nars. Why the name Deep...... Throat????? For the purpose of discussion, let's call this DT. It's so much easier for you and me because I don't want to suggest anything. I really hope NARS come out with more decent names for their fantastic products. At least, I won't feel embarrassed typing out the names. It's so much easier to say Dolce Vita than Deep you-know-what. Rumour says DT is created for those who don't really like the Orgams blush. I find it both equally beautiful. If I were to decide on one, I wouldn't know which one to pick. Light peach pink with minimal micro glitter. The glitter can be seen on the pan, but once swatch it is barely there. Very good pigment. The obvious difference between the two is that Orgams has way more glitter. The color for DT is much lighter and lean more towards pink and Orgams leans more towards peach. I must say both of them are quite similar, but not dupe. You can say, they're very much like brother and sister. On the pan it is so easy to see the differences but once you swatch it onto the skin, you can hardly tell which is which. I don't think this is an alternative color to Orgams. To me they both look different. In the previous post I mentioned that Orgams is very close to Benefit Coralista? The closer dupe to Coralista would be DT. They're somewhat different but similar. Do remind me to do a comparison post later because explaining in words is not so effective. Nonetheless, the DT blush itself is very beautiful. It also suit most skintone. It is a very safe color to invest on. It is very easy to love DT if you already like Orgams. Other than the shade, the formula for DT is exactly the same as Orgams. They're really pigmented, easily blend and the color payoff is really good. It does feel a little bit creamy although it comes in powder form. Anyone who love Orgams blush, but wants a lighter shade. Anyone who loves coral blush. Anyone who doesn't mind paying USD28 for a pan of blush. The usual.... NARS should really change their rubber packaging. My blush case is getting dirtier each day. It is pricey but you can definitely justify the price because it is high end brand. Yes. I'm just not too sure if I will repurchase this or Orgams. I love both of them equally. And don't forget, I'm offering NARS shopping service if you need anything from NARS. Check out <<this post>> for more details. @íм χшËî: Hahaha... Maybe next time when you finish up all your blush. I also think it's a bit pricey.